Get off the beaten snorkeling path. Try an adventure that takes you beyond the typical reef scene to some unusual places that will thrill your senses. From subterranean rivers in Mexico to Dominica’s volcanic carbonation to beluga serenades in Canada’s Hudson Bay, these 10 snorkeling sites score big on the novelty factor. And they’re sure to yield some spectacular stories you’ll retell for years to come. Once the ice breaks up in June, 3,000 Hudson Bay beluga whales head for the warmer waters of the Churchill River in Manitoba, their summer home. 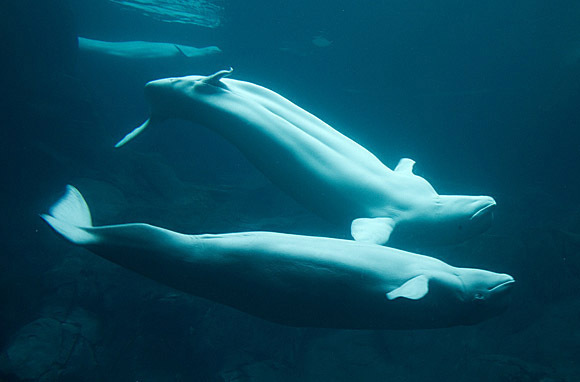 The whales' snow-white bodies glide through the saltwater like apparitions that seem inquisitive, even friendly. Slip over the side of a Sea North Tours Zodiac to greet them. Your arctic-rated wetsuit, hood, and cinched booties will keep you warm (enough) for a 30-minute or hour-long visit in early August. After the icy shock, your racing heart calms and you hear a pod in the distance whistling and chirping like canaries before eight or 10 whales appear, some within arm's reach. Sing to them through your snorkel, and they'll sing back. Getting there: Take a direct flight to Winnipeg from Chicago, Minneapolis, Denver, Las Vegas, or Orlando, plus all major Canadian cities. There's no road to Churchill. You have to take the train (40 to 50 hours) or fly (two hours) from Winnipeg. The Yucatan Peninsula might be known for coral reefs, but its most unique views through a mask are in the cenotes (seh-NOH-tays) beneath the Mayan jungle. The freshwater-filled sinkholes are like upturned mouths, some 2,000 of them, scattered around Playa del Carmen and beyond. Follow a guide down into the caverns connected by miles of beautifully illuminated subterranean rivers. At Hidden Worlds you kick through gurgling passages—so narrow your snorkel scrapes the stalactites above—that open onto massive rooms with jaw-dropping limestone formations. Young kids in tow? Paddle through a cenote on a Huck Finn-style raft at the nearby Xplor park. Getting there: Fly into Cancun. 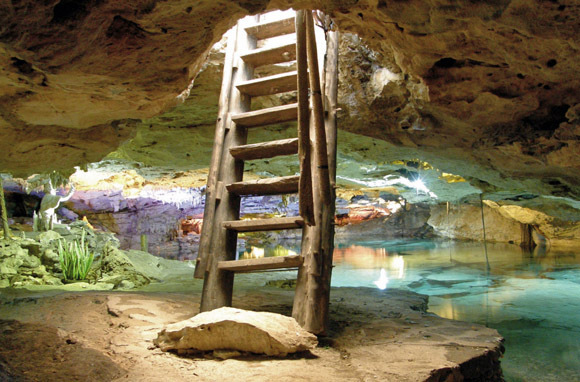 By car, Hidden Worlds is an hour and a half south of Cancun and 35 minutes south of Playa del Carmen. Xplor is five minutes south of Playa del Carmen. Both parks run round-trip shuttle service from area hotels. 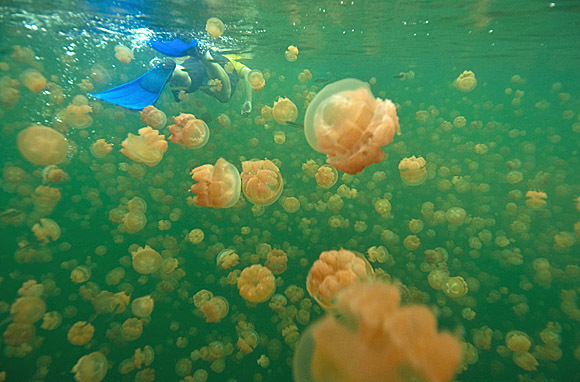 There's a lake on Eil Malk island in the South Pacific where jellyfish reality is suspended. You can snorkel through swarms and not get stung. How? Over the millennia, the golden and moon jellies of Jellyfish Lake have completely lost their sting because they haven't had to ward off any predators. After a lifetime of dodging these free-swimming hazards, though, most snorkelers still feel nervous entering the water. The sheer volume of jellyfish, as far as the eye can see, is otherworldly. You quickly realize bumping into one (or 10) is unavoidable. When it actually happens, and doesn't hurt, the moment is surreal. Getting there: Continental and United fly to Palau's Koror Island, where snorkel-tour operators offer trips to Jellyfish Lake, a 45-minute boat ride away. The remote lake is accessed by a short trail from the beach. 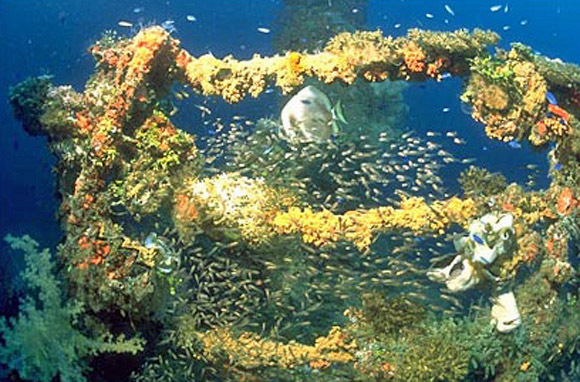 Usually, a sunken ship comes to mind when you picture an artificial reef. 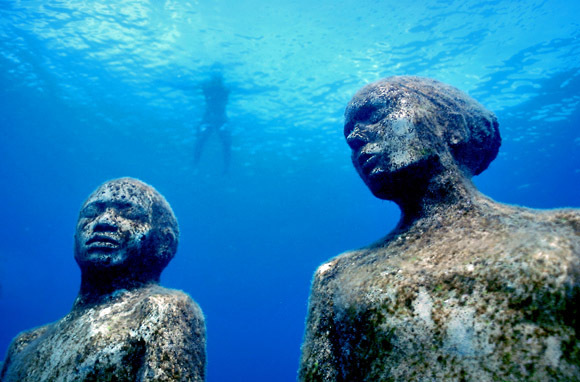 But in the reef just a few miles north of Grenada's capital, St. George's, a 65-piece sculpture garden sits on the ocean floor instead. Artist Jason deCaires Taylor created the Moliniere Bay underwater sculpture garden to help restore the bay's ecosystem a few years after Hurricane Ivan wiped it out in 2004. And it worked. Pink encrusting sponges now cover the face of a life-sized male statue like a mask. Little fish peck at growth on typewriter keys on the desk of The Lost Correspondent and swim between the wheels of another figure's bicycle. It's a fantastically bizarre parallel universe in shallow waters six to 26 feet below the surface. Let a guide help you see it all on a snorkel tour here or at Taylor's other underwater museum near Cancun. Getting there: American Airlines flies direct from Miami, and Delta flies nonstop from JFK Airport in New York. Bob Hope, Goldie Hawn, and other celebs and heads of state have visited this Vancouver Island city with the intent of reeling in a scale-tipping Pacific salmon. But the Salmon Capital of the World's latest craze isn't snagging one of the thousands that return to the river each year to spawn. It's joining them. Yes, eye-to-eye, fin-to-fin with 70-pounders that look as big as you feel in the water. Wriggle into a wetsuit with Destiny River Adventures, and a guide will take you to hot spots where the fish hang out in pools at low tide. 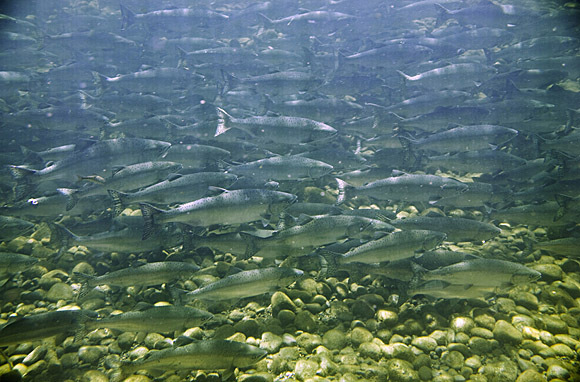 Jump in at high tide and you'll see fish blasting by you upstream. All five species of salmon show up at some point between July and October, with the best viewing in August and September. Getting there: Take a ferry or float plane from Seattle to Victoria or from Vancouver to Nanaimo. By car, Campbell River is three and a half hours from Victoria and two hours from Nanaimo. Volcanic activity is alive and well on the Lesser Antilles island of Dominica, and nothing compares to snorkeling in it. Check out the island's nine active volcanoes and its boiling lake—the world's second largest—or head straight for Champagne Reef. On Dominica's southern tip, near Pointe Michel, this snorkel site is easily accessible from shore. You can hire a guide and rent gear right on Champagne Beach. Swim out over the seafloor's geothermal vents that release streams of warm, tiny bubbles into the 82-degree water. You can hear the hum and feel the fizz on your skin. It's like swimming in a warm glass of Champagne. Reach into one of the 110-degree rock fissures, or let your guide point out the frogfish, seahorses, and other all-star marine life in the clear bay. Getting there: Several airlines offer connecting service from the U.S. to Melville Hall Airport on Dominica's northeast coast. Riding out into the Mediterranean Sea on a Zodiac, you'd never know an ancient city sits in the sand and silt just 400 yards off the coast of Pozzuoli. The boat stops at a nondescript orange buoy that marks the spot. Roll overboard and you'll see parts of Baiae's residential areas that were submerged when volcanic activity in the 16th century collapsed the coastline. 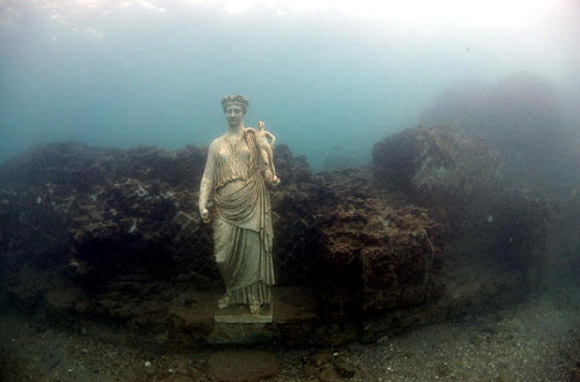 Now an underwater archaeological park in 15 feet of water, Parco Archeologico Sommerso di Baiae includes villas with gorgeous marble mosaic floors. At the shallowest of the five sites, snorkel tour guides will dive down, brush away the sand, and retell stories about the statues, the columns, and the street lined with taverns that served this busy port in its heyday. The other four sites are great for scuba diving and freediving. Getting there: Pozzuoli is six miles north of Naples. Meridianafly flies direct from New York's JFK Airport to Naples in the summer. Other U.S. airlines offer connecting flights year-round. Or, fly into Rome and take the Eurostar train to Naples. Every night after sunset, a dinner-theater show happens just offshore Hawaii's Kona Coast. Microscopic plankton rise toward the ocean surface to set the scene. Charter companies bring underwater lights to illuminate the main dish and attract more. Onlookers adjust their masks, snorkels, and cameras then wait for the action. 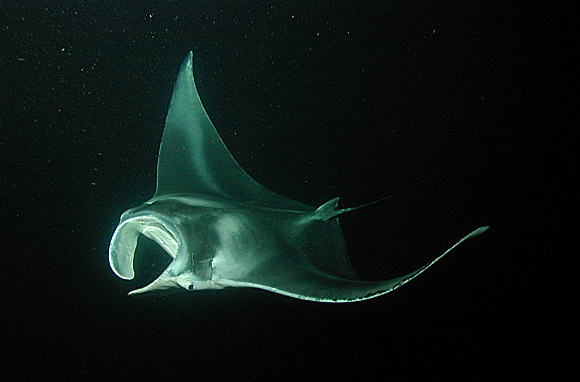 From out of the darkness, almost on cue, as many as 12 manta rays, some with wingspans of more than 15 feet wide, swoop in to feast on one of their favorites. These toothless, barbless wonders float and swirl through the water, just inches away, with hypnotizing grace as their gaping mouths scoop up the plankton. Fair Wind's nighttime manta tours depart from Honokohau Harbor, just north of Kailua-Kona, and go to active feeding areas, usually in Garden Eel Cove or in front of the Sheraton Keauhou Bay Resort. Getting there: From Kona International Airport, it's a 15-minute drive south to the Honokohau Marina and 30 minutes to the Sheraton Keauhou Bay Resort. Two years and two months after the Japanese bombed Pearl Harbor, the U.S. attacked the Imperial Japanese Navy base in Micronesia's Truk Lagoon, sending 60 ships and 275 airplanes to the ocean floor. The ghost fleet, now coral-encrusted in clear waters, has long been a bucket-list destination among scuba divers. 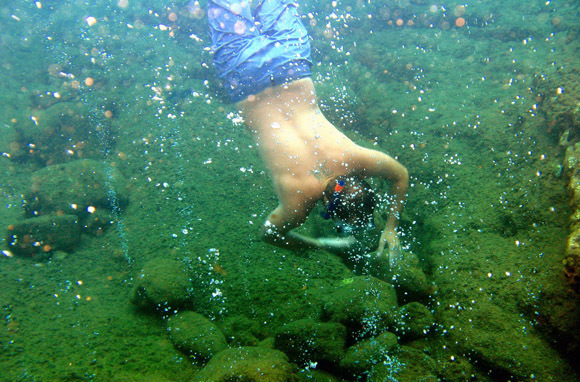 But even snorkelers can glimpse frozen-in-time history in this protected lagoon. Hover above one of the 15 ships and planes poking up near the surface. See tankers and gunboats with holds still filled with ammunition, gas masks, and human remains here in the biggest graveyard of ships anywhere. Getting there: United runs regularly scheduled flights from Guam and Honolulu. Taxis, hotel airport shuttles, and rental cars are available in Weno, the capital city of Truk state. A sure sign winter has officially begun in Florida: the arrival of manatees. When the Gulf of Mexico drops to 68 degrees, they return to the warm springs in the Crystal and Homosassa rivers. It's only a four-degree difference, but for pudgy marine mammals with surprisingly little body fat, it's a significant shift. Here, in clear water less than seven feet deep, they're as excited as puppies to interact with others after what can be a solitary summer. They love attention and early mornings. Book the 6:30 a.m. snorkeling tour, when they will swim right up to you (in slo-mo), roll over, and even occasionally rub against you. Depending on the day, you could see 15 or only a couple. 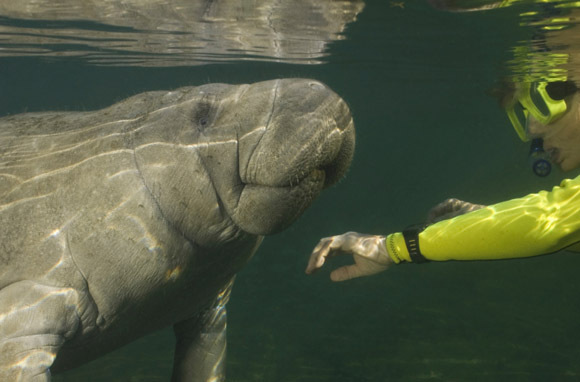 Best time to go: November through March, although some manatees stay in the river year-round. Getting there: The city of Crystal River is a 75-minute drive north from Tampa and a 90-minute drive northwest from Orlando. Where do you love to go snorkeling? Tell us in the comments below!